Nellie McClung from the monument on Parliament Hill, showing historic newspaper headlines from the Persons Case. Photo: “Les Girls” – The Famous Five 10, Douglas Sprott, CC BY NC 2.0. Humanity has an incurable habit of imposing meaning onto our surroundings. We transform every place we encounter into a landscape of the imagination, tinged by interpretation and experience, and populated by locations like “hometown,” “favourite fishing spot,” “sacred site,” and “mother country.” The tourism industry has long taken advantage of this to construct narratives which inspire travel, but place has also featured prominently in our interactions with the past. Commemorations often focus on place – declaring not only that an event occurred, but that it occurred here. But who determines what places are important, why they are significant, or how they can be used? How can space be reclaimed for marginalized voices to share interpretations of what those spaces mean to them? During this year’s Canada’s History Forum and the Governor General’s History Awards, held in Ottawa a little over a week ago, I had the opportunity to hear about some of Canada’s most exciting historical projects – and many of them use place as a vehicle for sharing those less-heard stories. From Parliament Hill to our dusty attics, people are turning to locations both familiar and rarely seen to share alternative perspectives of the past. The first example of such “reclaimed” spaces that I encountered at the History Forum was the Famous Five monument. Focusing on the achievements of women, this year’s Forum began with a reception to mark the statue’s 15th anniversary. 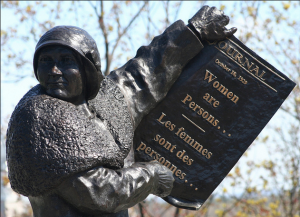 The monument depicts Emily Murphy, Irene Parlby, Nellie McClung, Louise McKinney, and Henrietta Muir Edwards after their successful campaign for women to be regarded as persons under the law. The first Famous Five monument was erected in Calgary in 1999. An identical copy was later installed on Parliament Hill – the very place that the Famous Five fought to be recognized in, and a place where their achievements can be honoured alongside those of other nation-builders. The statue’s location contributes to the story of the Famous Five and their legacy. As Isabel Metcalfe (Chair of Famous Five Ottawa) explained at the Forum, the Famous Five monument creates a fascinating tableau when considered in the context of statues around it. Close by, for example, is John A. MacDonald, who would not write women into Canada’s Constitution. In direct contrast, William Lyon Mackenzie King’s monument bears witness to the triumph of the Famous Five. Mackenzie King appointed Cairine Reay Wilson, Canada’s first female senator, following the conclusion of the Persons Case. The Famous Five statue is located next to the East Block, which once housed the office of John A. MacDonald and today contains the offices of men and women senators. Situated along a well-used route, the Famous Five are constantly entertaining guests. An empty chair invites visitors to join them. It is a place where today’s Canadians can imagine their role as citizens and change makers in light of the past. Although not all of the views expressed by the Famous Five are palatable to us now, the statue is a reminder not only of the historic struggle for women’s rights, but also the continued need for activism in an ever-changing world. After the tribute to the Famous Five, the Forum continued to offer examples of using space to tell stories. Dr. Rose Fine-Meyer highlighted the importance of connecting students with local events, especially in the case of women’s history, during the day’s final panel on “Researching the Lives of Women.” Local stories, she explained, in turn become a gateway for discussions about national and international issues. As for the Governor General’s History Awards, several projects made use of place to connect the public with “hidden stories.” I will highlight only a few of them, but the full list of recipients is available on the website for Canada’s History. One of two award winners for Excellence in Community Programming, the Musée de la Gaspésie’s exhibit Tout en héritage! sheds new light on Gaspé history by looking outside the museum walls. Local families searched their homes for favouritehistorical objects, with the top 15 being displayed in local libraries. What a fun way to shape the content of an exhibit, and what a great way to involve the public. By engaging the community as grassroots curators, the exhibit brings value to local history and ordinary residents. The prize for Excellence in Museums was awarded to c??sna? ?m: the city before the city, an exhibit that quite literally reclaims spaces for the Musqueam First Nation to tell their history on their terms. The exhibit was created in collaboration with the Musqueam First Nation, the Museum of Anthropology at UBC, and the Museum of Vancouver. Each partner hosts a distinct exhibit which contributes to the larger whole. Additional installations, including one in a public transit station, bring the exhibit to thousands of city residents and visitors. The exhibit explores “the ancient landscape and living culture” of c??sna? ?m, the village upon which Vancouver is now built, and highlights the site’s continuing significance. Through this collaborative project, the city itself is re-imagined as a vehicle for delivering urban indigenous stories. 1908 photo of the c??sna? ?m site. 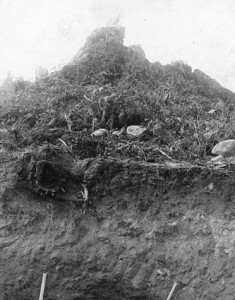 First unearthed in 1884, controversy erupted over possible condominium development on the site in 2011. The Musqueam First Nation has now purchased the property. It is also designated as a National Historic Site. In so many ways, the projects recognized at the Forum touched on the significance of place to individual and collective identity, and the continued importance of place in the work of historians. This in turn connects to my research interest in maps. 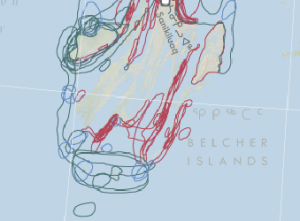 Recently, my work has combined GIS maps and oral histories to record traditional knowledge and land use. In addition to recording how people interact with land, I think of it as a way to reassert the traditional significance of places both well-known and rarely seen. Through land use studies, the colonial aspects of cartography are turned on their head, while the map’s strengths as a visual medium are used to communicate alternative meanings and histories of place. Canada has not strayed far from its past. As we celebrate the anniversary of the Famous Five monument and the upcoming centennial of women’s suffrage, we are faced with the present-day tragedy of missing and murdered indigenous women and recent debates over how women have the right to dress. As we look to the legacy of c??sna? ?m and map the knowledge of generations of indigenous peoples, we must also face the revelations of the Truth and Reconciliation Commission. All Canadians stand to benefit from spaces where our multifaceted history can be encountered (or confronted) and discussed. Equality, truth, justice, reconciliation, and dignity belong in our streets, schools, homes – the local and the grassroots. It’s in these very spaces that some of the most exciting historical work is happening today. The sheer diversity of these efforts – exhibits, literature, monuments, performance art, and maps – testifies to the fact that there are innumerable ways of being in the world and interacting with Canada’s history. Stacey Devlin is a Research Associate with Know History Inc. in Ottawa, Ontario, where she provides historical research services and GIS support. She also does freelance research and writing for historical projects. Stacey holds an M.A. in Public History from Western University, and she just might love maps enough to write a book about them. Yi-Fu Tuan, “Space and Place: Humanistic Perspective,” Philosophy in Geography, ed. S. Gale and G. Olson (Boston, MA: D. Reidel Publishing Company, 1979), 387. Just a minor addition to note for reasons of departmental pride: the c??sna? ?m exhibit was also co-curated and developed by Professor Susan Roy in the University of Waterloo’s Department of History. See https://uwaterloo.ca/stories/governor-general-honours-waterloo-history-prof. Thanks Ian for pointing out Susan Roy’s involvement as well! Very impressive work done by all parties.